One of the major obstacles with treating cancer is that tumors can conscript the body’s immune cells and make them work for them. Researchers at EPFL have now found a way to reclaim the corrupted immune cells, turn them into signals for the immune system to attack the tumor, and even prevent metastasis. Macrophages are cells of the immune system that protect the host from invading pathogens. But in cancer, macrophages can be “hijacked” by tumors, and made to support their malignant growth and spread. This is a drawback for a major cancer treatment, immunotherapy, which turns the body’s immune system against the tumor. EPFL scientists, working with colleagues at the Roche Innovation Centers in Munich and Basel, have now identified a molecular “switch” that can convert the “hijacked” macrophages into cells that can stimulate the immune system to fight the growth and spread of cancer. The work is published in Nature Cell Biology. Along with attacking foreign pathogens like bacteria, macrophages also help the body’s organs develop and its wounds heal. Their own behavior is fine-tuned by small molecules that they produce, called microRNAs. When a tumor begins to develop, macrophages attempt to block its growth. But often tumors hijack them and convert them into what are known as “tumor-associated macrophages”, or TAMs for short. Now corrupted, TAMs use their microRNAs to shield the tumor from the patient’s immune system, helping it grow and metastasize. This phenomenon is common across many tumor types. It is one of the major obstacles in treating cancer, and often leads to a poor prognosis for the patient. Michele De Palma’s team at EPFL found how to reclaim TAMs. The researchers genetically modified TAMs to remove their ability to produce microRNAs. As a result, the TAMs were reprogrammed dramatically. 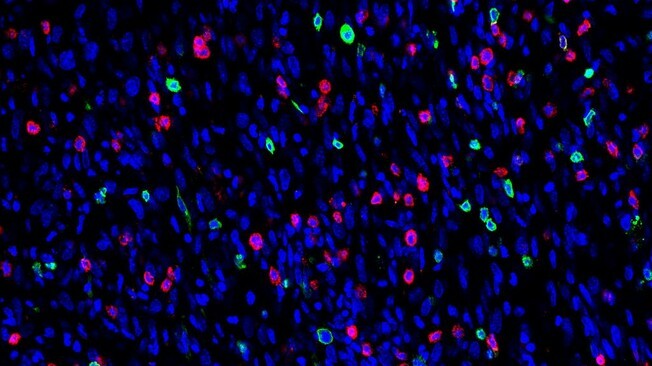 Instead of protecting the tumor, the TAMs now signaled the presence of the tumor to the immune system, triggering attacks against it – and did so very efficiently. However, more work is needed to translate all these findings to actual therapies, especially since there is currently no way to block the Let-7 microRNAs selectively in TAMs. But De Palma’s lab is now working with bioengineers at EPFL to design drugs that can target the Let-7 microRNAs specifically in the TAMs. Some of the most promising cancer treatments are immunotherapies, which are based on provoking or enhancing the patient’s immune response against their tumor. “The most exciting finding was that TAM reprogramming greatly improved the efficacy of immunotherapy,” says Michele De Palma. “Our results in experimental models of cancer suggest a new therapeutic strategy based on inhibiting the microRNA machinery – or the Let-7 microRNAs – specifically in the TAMs, which may unleash the power of mainstream immunotherapies, such as immune checkpoint inhibitors”. The first authors of the study are Caroline Baer, who recently obtained her PhD from the Doctoral Program in Biotechnology and Bioengineering (EDBB), and Mario Leonardo Squadrito, senior post-doc, both in De Palma’s lab. The study involves a collaboration of EPFL’s Swiss Institute for Experimental Cancer Research (ISREC) with the Roche Centers for Innovation at Basel and Munich. It was funded by the Swiss National Science Foundation (SNSF), the Fondation pour la lutte contre le cancer, the Swiss Federal Commission for Scholarships for Foreign Students, and F. Hoffmann-La Roche AG.